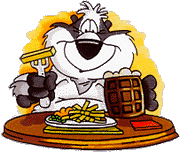 Welcome to the Fat Badgers Guide to Quality Inns, Pubs, Restaurants and Hotels in the United Kingdom. The original independent Guide Listing some of the very best inns of character serving Good Food, Good Beer or Good Hospitality. The Fat Badgers Guide to Quality Inns of the British Isles provides a guide to pubs in the United Kingdom which give the highest standards of British hospitality, traditional ales and superior cuisine. Who are the Fat Badgers?